Another lazy day, and the last in my relatively lengthy stay in town. 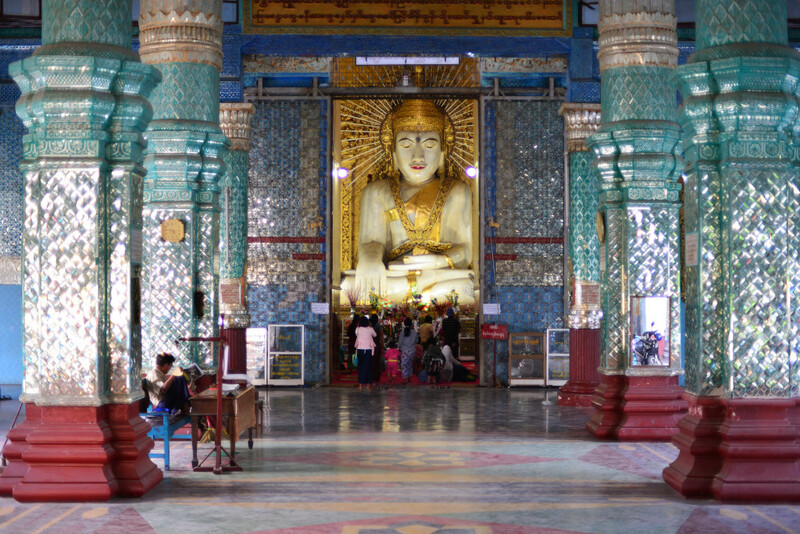 I had originally intended to do a top-up trip to Amarapura, but that’s not really how things unfolded today. I was o have exchanged the rental bicycle for a motorcycle at the Mann Chinese restaurant, but the effort became somewhat convoluted, distracted by looking for a suitable place for brunch. The Shan Ma Ma on 81st Street reeks of rotting pork, and further along to the north, no remotely suitable place to eat appears. 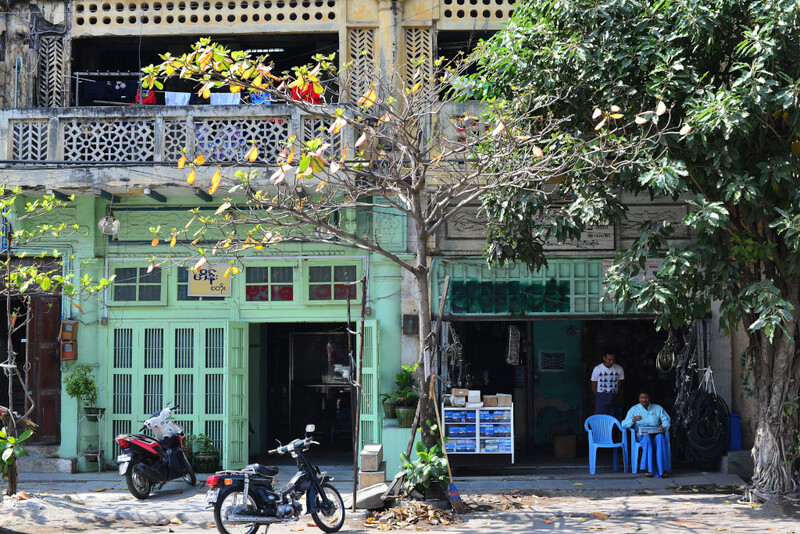 As I meander further, my curiosity is provoked by the intriguing mix of architecture and people, the area between the post office and Dravidian temple probably the most interesting in Mandalay. A small bowl of tasty soup at the Pann Cherry Shan-style eatery ensues, the local women seated at the table in the corner beaming self-consciously as I laud them for their singing skills. 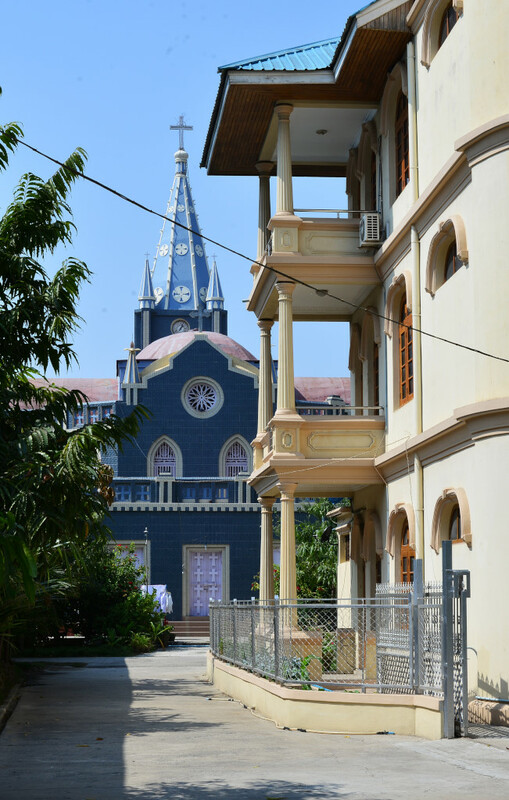 The cerulean and white Catholic church at the back of an alley is one of a diversity of places of worship in the area which also includes mosques, Dravidian and Buddhist temples. 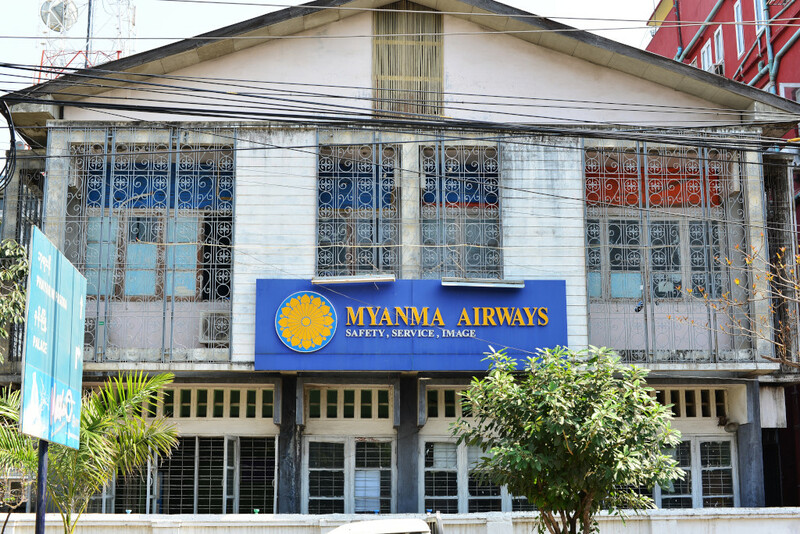 Across from a two-story faded wooden structure emblazoned with a sign for Myanmar Airlines – but always closed – a group of longyi-wrapped men are huddled in the shade of a tree, playing a chequers-like game on a cross-shaped board, ignoring me entirely as I snap their photos. 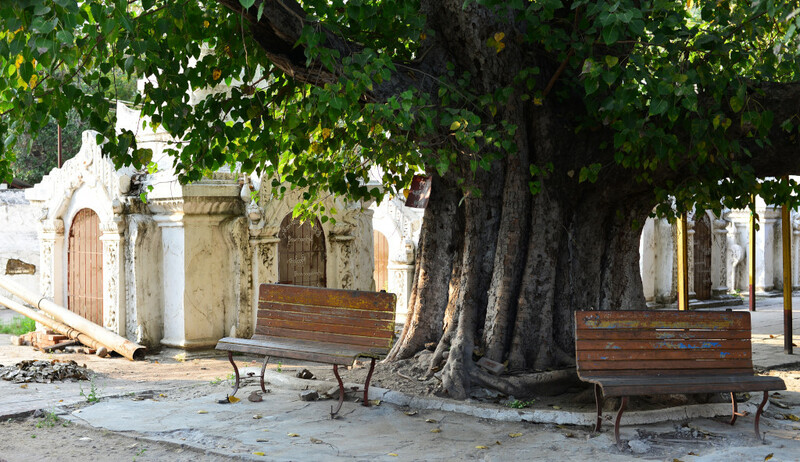 The area is rich in old, shade-bearing trees and wooden and stone shop houses, mouthing directly onto the heavily potholed streets and chaotic traffic. A young girl is only too happy to have her picture taken, but her dowdy mother (or grandmother?) recoils laughingly at the idea, running to the back, where an older man and even more ancient wheelchair-bound woman are hunched over their Qurans, mechanically reciting prayers uninterrupted by my unannounced presence. The passage leading to the towers of the mosque opens up a hidden world, a compound of continuous weather-worn but colourful two-story wooden houses, the upper floors typically but not always featuring open verandas, some houses with vendors selling prepared foodstuffs and snacks, beaming at me as I peruse their goods. 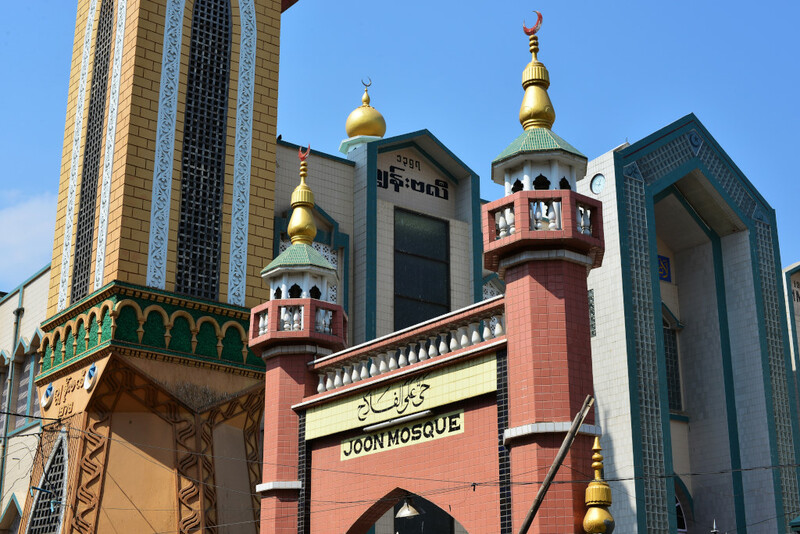 The mosque’s wide washing basin is lined with Burmese of Indian origin performing their ritual ablutions, looking at me politely but without the degree of enthusiasm I see elsewhere, perhaps a reflection of their cultural background or sooner of the historic tensions that exist between the Buddhists and minority Moslems, which only recently flared up violently again. Intimate, textured and colourful, the pocket offers a microcosm of the exotic diversity of the city centre. However, women here are not welcome photographic subject matter! At the Aurora craft store on the east side of the bridge, the older French women assure me that this is not the place to buy anything, but perusing the dusty lacquer wares and puppets at least gives me something else to do in the day, given that I have resolved not to go to Amarapura, having set my sights far lower. 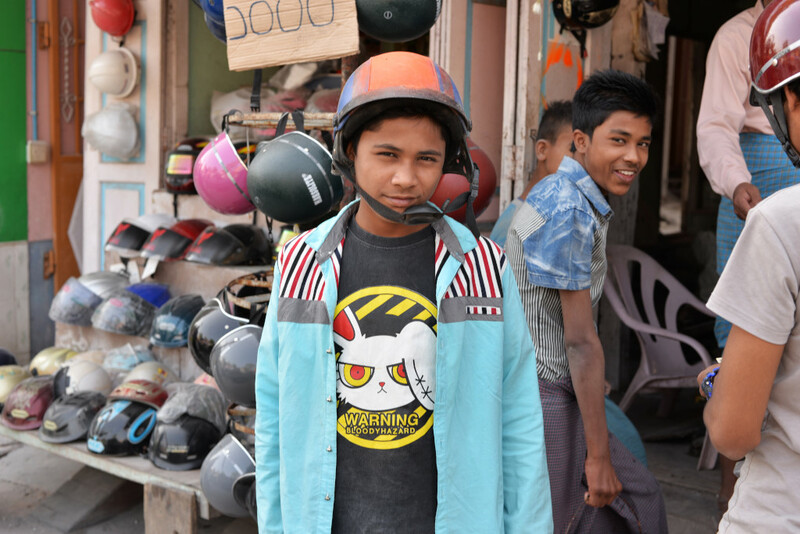 They also have mixed feelings about coming here after having traveled extensively in Asia, despite having heard remarkable things about Myanmar. Traveling is an egocentric thing, the traveler wanting unique, authentic, and intimate experiences of a place, which is simply not possible when endless package tourists arrive at the most minor attraction. Then their own country has so much to offer, the traditional hinterlands of this relatively expansive country still beholden to old traditions and culture. They listen demurely to my rapturous description of the gems I found in the country in my now faltering French, beauty that is found no less in off-beat areas such as La Perche in lower Normandy, where they now live. 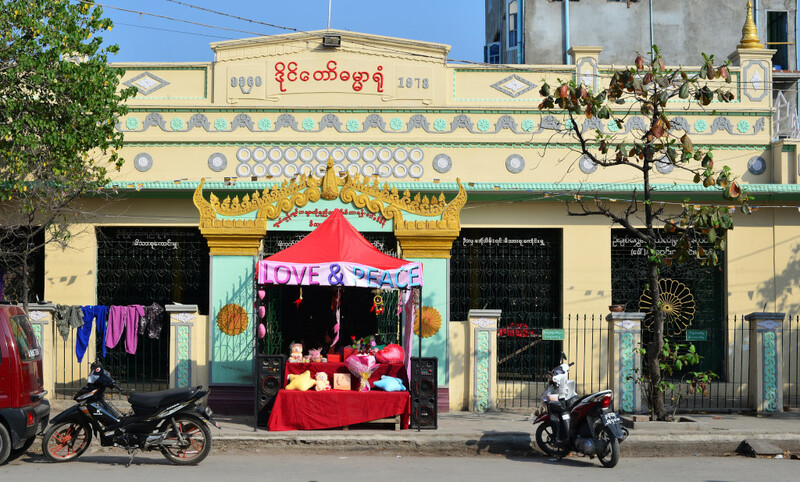 The spectacle on 80th Street is of a very different nature, the young vendors of Valentine’s Day gifts, boxed chocolates, dried flowers, and oversized stuffed teddy bears mustering as much enthusiasm as possible, largely expressed by lots of giggling, gossiping and texting. From the view of the relentless cordon of motorcycles passing by, it seems there are many takers, considering the number of the young men clutching onto bouquets of flowers or couples holding onto their teddy bears. I shoot continuous photos to get a sense of being on the road here, although what stands out is the youthful romance of it all. 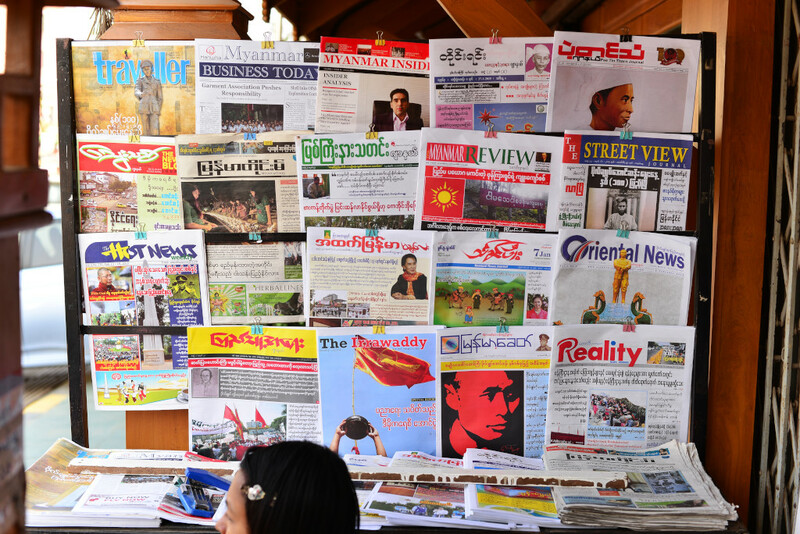 Eastward on 30th Street, a newspaper stand with a variety of publications attracts a visibly intellectual clientele, the prominently displayed pictures of Aung San both on several magazine fronts as well as a big placard in front of the shop can hardly be missed. The customers look at me expectantly, but I just want to take some photos and go. 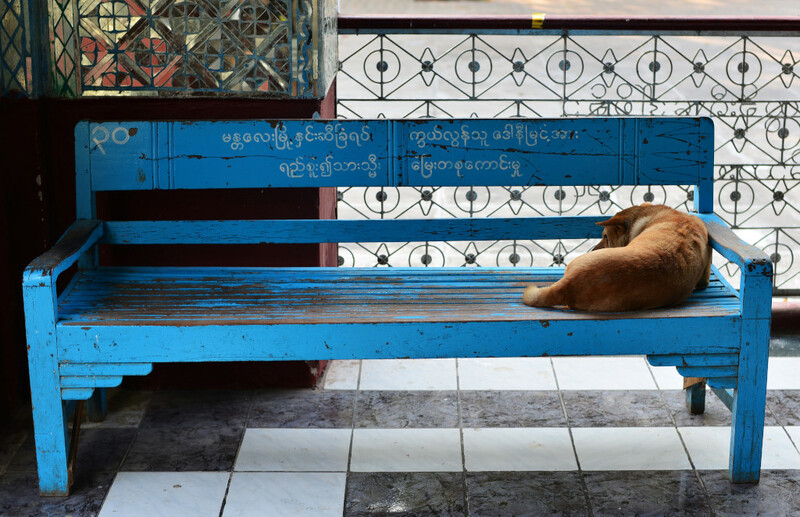 There are no English publications to speak of, and without Burmese I may not be able to enter into any kind of meaningful discussion, as much as I would love to. Men carry their wallets tucked into the back of their longyi, their cell phones clipped to the other side, often also with small carrying bags for all those other things that would normally fit into pockets. 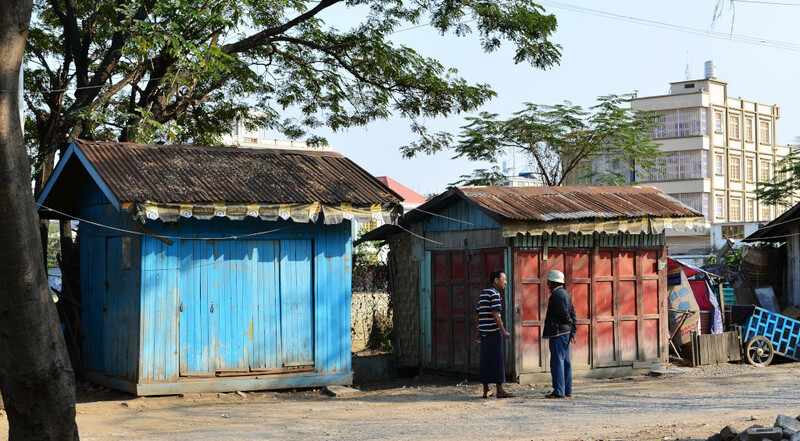 Both men and women wash themselves at public bath stalls sheltered from the street with low walls, although exposed enough to warrant revealing everything. Just as in the Cambodian countryside, men freely strip down to their shorts or equivalent when washing at public pools, but women would never dream of doing so. Then in predominantly Moslem Malaysia and Indonesia, taking clothes off anywhere in public is anathema anyway. 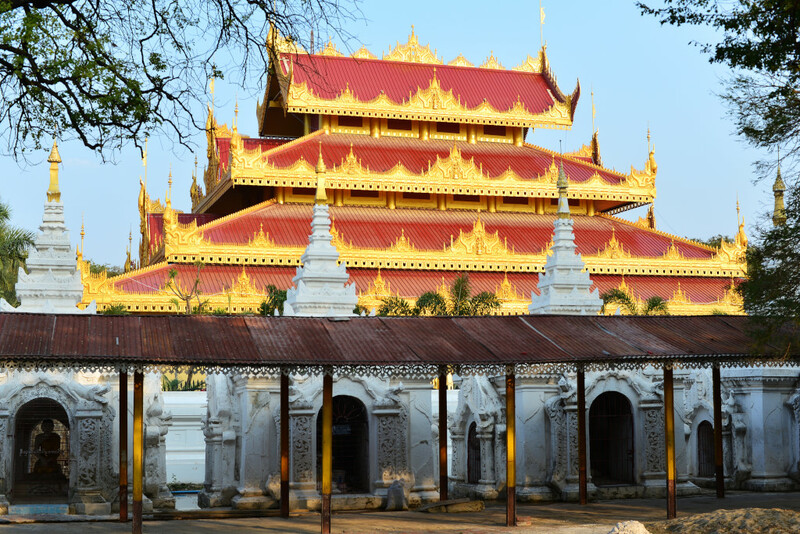 Only a few tourists are present at the Kyauktawgyi Paya, located roughly between Mandalay hill and the Golden Palace, deep in the nexus of Buddhist temples northeast of the fort, a good place to get unequivocally sick of seeing their ilk. 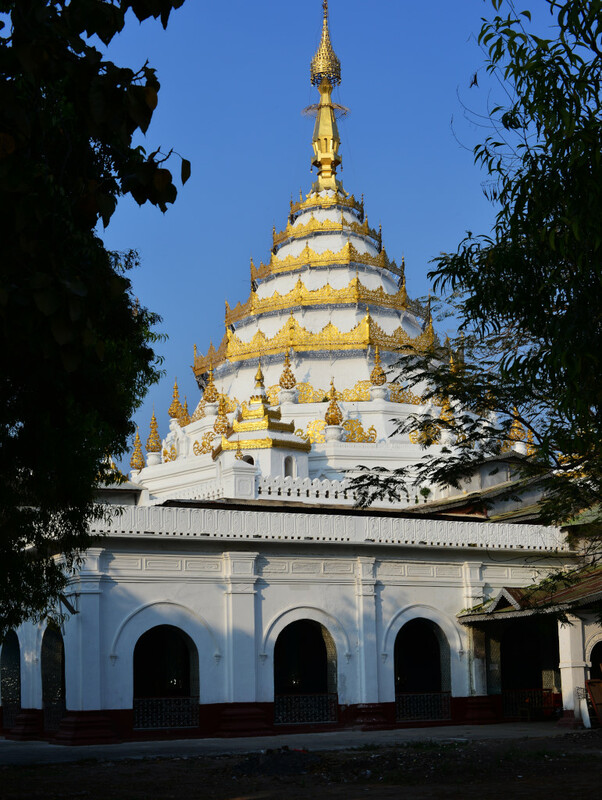 This complex is extensive as it is relatively simple, visited by few tourists mostly due to the competition and also because large amounts of the temple are under repair. 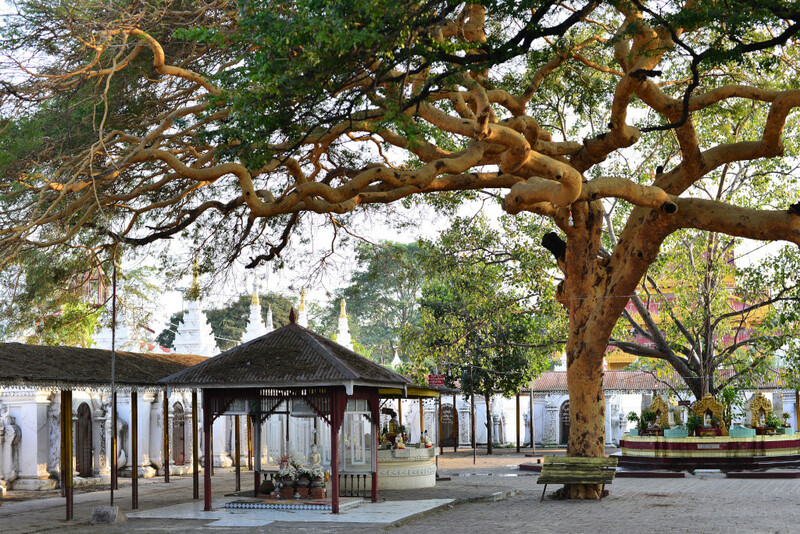 The expansive courtyards are anchored by golden-swathed Bodhi trees whose girth bespeaks their age. 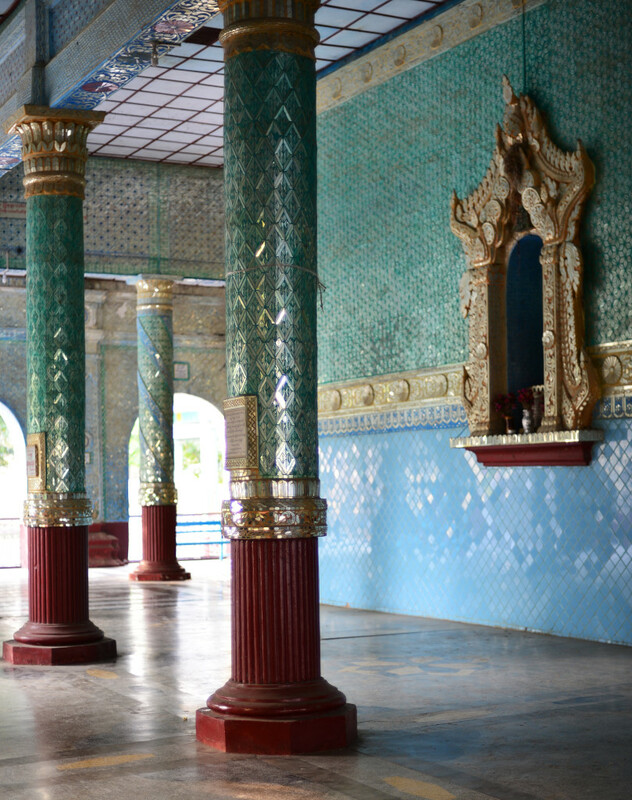 Inside the large cream-coloured pavilion with terraced gables fronted with ornate golden bargeboards, a spacious concourse embraces the central chapel housing the golden Buddha statue, the play of light and darkness accentuated by the layer of pale green and translucent mirror shards coating the walls. 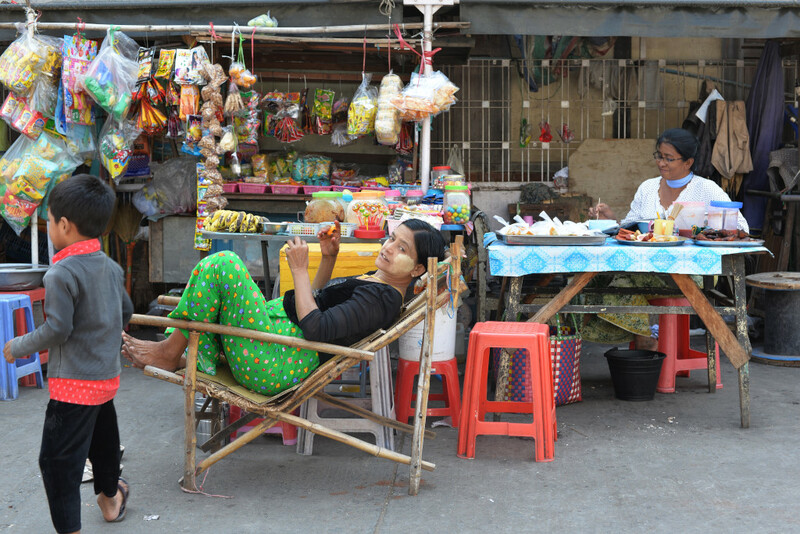 Men recline on benches with their legs tucked inside their longyis, completely absorbed in their newspapers until the odd female tourist wanders by, camera in hand, and then the newspaper is completely forgotten. Dogs roam the broad terrain with no particular goal in mind while furtive couples nestle amongst the foliage in some distant corner of the whitewashed chhatri-lined courtyard. 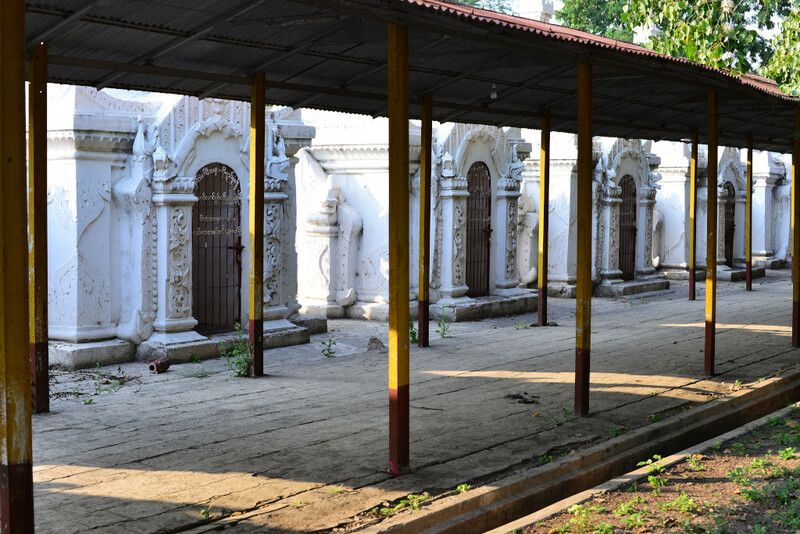 The large grid of miniature whitewashed stupas radiates in symmetrical arms from a central stupa at the UNESCO-protected Kuthodaw Paya, each of the 729 chapels housing a unique sacred inscription, which represents the largest book on the planet in some manner of speaking. The immaculate circular tiled inner plaza houses prayer areas whose atmospheric quality would be underlined by the groups of scarlet-robed monks in deep meditation if it weren’t for the traveling circus act of European package tourists taking photos of everyone and everything, including the usual thrusting of cameras into monks’ faces to get that perfect money shot. My energy and desire for more of this sacred carnival environment is pretty well sapped for the day, and I am happy to leave without taking any photos, happy also to know that after having brushed off the female parking attendants who insisted that I pay for parking my bicycle, my vehicle was left alone, and I can ride off again. I now understand why I was quite happy to skip Amarapura today, as I have little patience for the element of the ridiculous that mass tourism has reduced the major attractions in this country to. 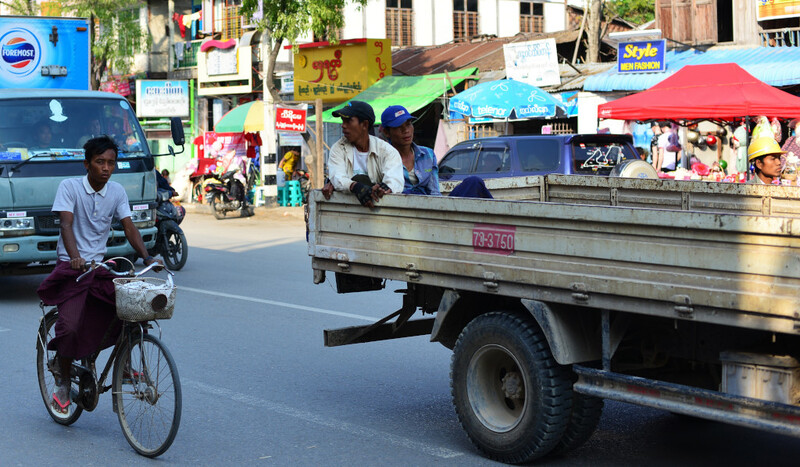 A larger priority looms – the need to stock up on food for tomorrow’s trip, still remembering the virulent food poisoning I got 18 years ago on the train from Mandalay to Pyin U Lwin. Once I have absolved myself of the need to focus my attentions on anything to do with Buddhist temples, I am ready to return into town, eat, buy provisions for the long journey tomorrow, visit an ATM, return the bicycle, and if I feel very motivated, go the Moustache Brothers show and/or get a haircut. 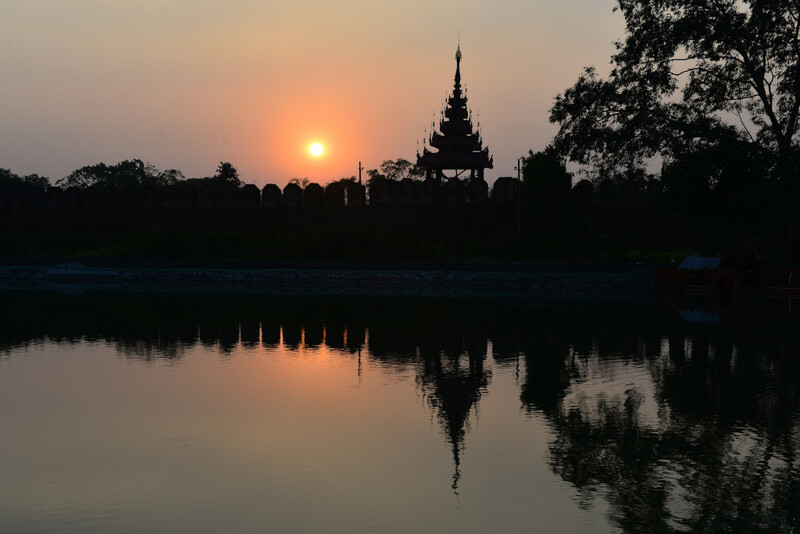 The long and last ride down the eastern face of the fort, taking in the spectacular sight of the brilliant orange sun descending over the walls of Mandalay fort, a flock of birds wheeling in formation high in the empty sky. I continue south on 68th Street, where I found the unusual Burmese salad restaurant earlier on in the day. The young staff eagerly attend to any client that happens to venture through the portal, especially foreigners such as myself. The interior is somewhat stuffy and doesn’t smell quite right. The expansive terrace in front is divided into separated compartments anchored by large, round tables, with a secondary area to the side with conventional tables and chairs. The waiters scurry back and forth to attend to my every need, and the only one that speaks English is admirably professional. While the restaurant offers a number of what I take to be Burmese-style curried dishes, presumably served with the plethora of typical side dishes, the bulk of the menu is devoted to salads. Burmese-style salads typically involve braised greens, and in the case of this restaurant, exotic greens I have never imagined eating. I choose three different dishes, the mangrove trumpet blossom salad slightly citrusy, oily, and amended with peanut, the nodding clerodendrum reminiscent of kale, with touches of garlic, sesame, and fish paste, and lastly, the frangipani salad tasting of spinach, garlic, mace and fish paste, although I may be completely off as far the spicing is concerned. As I point out the dishes on the menu, the young waiter assures me that none of the dishes is made with fish paste. His assertion seems doubtful given the easily identifiable rank taste, although thankfully the dishes are not inundated with fish paste either. The nodding clerodendrum turns out to be also known as East Indian glory bower, a perennial shrub used in northeastern India for the treatments of diabetes, hypertension, cough and rheumatism. The culinary offering here is certainly as exotic as anything I have encountered anywhere, and certainly as anything I would consider remotely palatable. 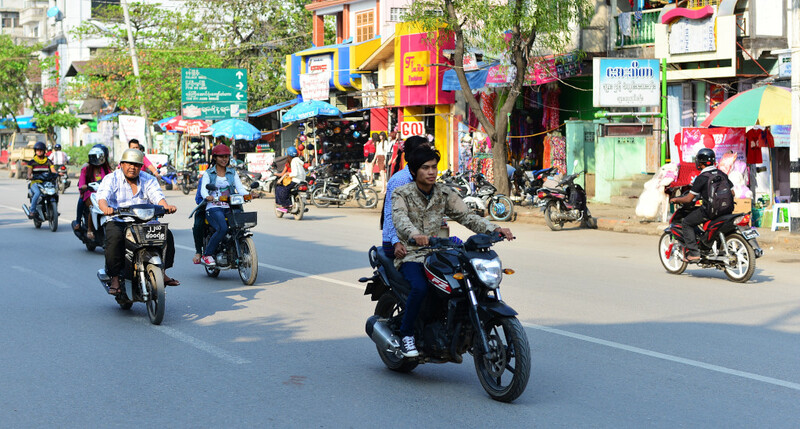 Heading westward through the darkened alleys, I attempt to find my way along the heavily broken pavement, the state of the street no indication of the relatively posh residential properties and restaurants that populate the eastern parts of Mandalay. Further towards the train station lies the clutter of market stalls where mere mortals can afford to eat, then some north-south channel entirely blocked off from construction, over to 35th and back north onto 78th to the gigantic mall that is the anchoring commercial experience for all the young local debutantes. Here, as everywhere else in the world, the allure of consumerism elevates shopping to the most powerful and transformative of experiences. But the manner in which the groups of small Burmese look at the most modest goods and turn them over repeatedly in their hands, the shining faces of young romantic couples celebrating their special day together by buying some insignificant box of chocolates, or entire families assemble at the cash register to purchase nothing more than a few items illustrates poignantly the elusiveness of the consumer dream for the mass of Burmese. And finally riding back to the hotel, slowly navigating the potholes, oblivious to the traffic ahead and behind me, not that anyone really cares here, since everyone else drives chaotically, too. I have to explain to the owner of the Mann restaurant and bike rental that I owe her two days rental, then pay. Amazingly, her restaurant is full of foreigners, not that it is so great, just that it is listed in the Lonely Planet, and people understandably grasp at straws itn the face of the typical grimy street eateries with the very challenging local food. Not that the same street eateries aren’t full of westerners too – in fact, I stop and stare at some of the people I see, wondering what they must be thinking. 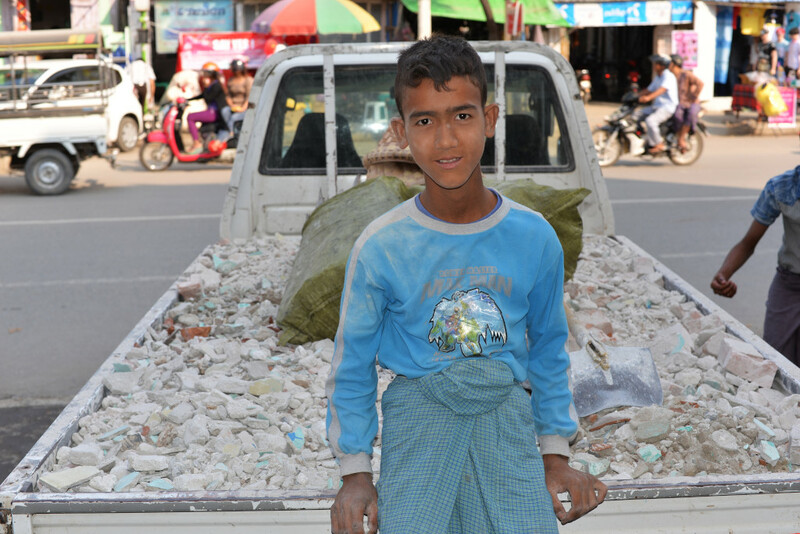 I always think about food, not a good thing in Myanmar. At the paratha place, a small ball of dough is flattened into a paper-thin pancake, then tossed into a slightly concave griddle lubricated with a small pool of oil, the pancake amended with a dhal-like filling, the edges folded inwards, then the entire paratha flipped over and moved to the centre of the griddle, where more oil is dribbled over it, the pastry removed, and passed to a man at an adjoining counter, who cracks the paratha with his fist, then packages it for the waiting crowd of clients. Watching the seemingly well-executed procedure makes me shudder somewhat, thinking of how exacting the preparation of unleavened breads can be in northern India, particularly in the areas with Mughal influence. The idea of drenching a paratha, chapatti or naan into an oil bath would be utterly anathema – and then chopping it up or breaking it is simply not done, either. On 30th Street, I see what looks like a brightly lit carnival ride, with a few food stands collected on the perimeter, but not in and of itself reason to alter the course of my walk. Passing by the hair salon one last time, looking at the crew of young men beaming expectantly as I pass, a sad way of spending Valentine’s Day with not even a single client in sight, probably putting in longer hours than pretty well anyone here, and probably very poorly remunerated at that. Another group of backpackers is challenging the night porter’s English as I haul my things up the four flights of stairs, eagerly anticipating the functioning air conditioning, firm mattress, and retreat from the discord and pollution of the outside world, however small my room may be.